There’s a shot in ‘The Harvest of Kairos’ – in fact there’s a number of shots – of ‘Fedsat 2’ the headquarters of Federation space command. It’s the only time we see this shot in series 3, and certainly the last time we will ever see this model shot. The question it posed in my mind is whether it existed following the events of Star One? There could be many assumptions as to why it features in ‘The Harvest of Kairos’. It could be an erroneous shot, or it could be duplicate space station, or something else entirely. I’m going with this question based on the fact it is already an established image within the series, and without any other established explanation, it is Federation Space Command. The third series discusses the extent of the Federation battle fleet, and the strength of the administration. ‘Aftermath’ and ‘Powerplay’ makes reference to a severely diminished fleet. ‘Volcano’ offers a more optimistic viewpoint. Here Servalan is trying to re-establish the Federation’s power. Tarrant states ‘A sizeable remnant of the battle fleet is still operational.’ Yet the next time the Federation is discussed (during ‘Kairos’) Tarrant quips ‘There isn’t a federation anymore.’ Even in the later episodes of the season, there is variance. In ‘Rumours of Death’, Sula says mentions something about other worlds, and people like ‘her’ (Servalan), and by ‘Ultraworld’, Tarrant has had a sea change, mentioning the rate Servalan’s empire is expanding. Yet in ‘Moloch’ Grose make reference to Servalan’s willingness to travel far far away from the safety of her battle fleet, in order to salvage a single legion. In ‘Aftermath’, it is established that Servalan left her headquarters for political reasons, and at no point is there any kind of reference to it being destroyed. On the other hand – once we have had the establishing shot – we cut to the set of Servalan’s battle cruiser, introduced in ‘Volcano’ – this alone is a big factor. And why is it important at all? I think the answer to this is quite symbolic. In the first two seasons, that slow pan of the camera, the music, and the steady rotation of the satellite was the ultimate sign of federation power, menace and threat to the Liberator crew. It was the constant reminder to the audience that they were fighting a hugely well resourced enemy. It was the ‘Death Star’ of Blake’s 7. The appearance of it in ‘The Harvest of Kairos’ signposted how much I should continue to see the Federation as a serious threat to the Liberator crew no matter the mixed messages communicated by characters and story lines in series 3. But there is another reason I wanted to discuss this. Sometimes when I watch an episode I have let a plot detail or inconsistency get the better of me, to the point where it defines whether an episode is good or bad. I know I’m not the only one – many fans/critics do the same thing. When I first watched ‘The Harvest of Kairos’ I started to wander how Servalan knew of Tarrant, and his involvement with the rebel unit. It felt like I was using this possible lapse of explanation as something which might affect my opinion of the episode overall, and this re-watch for this blog post would be valuable to see if, after, all this time I could forgive Blake’s 7 (and indeed any other show I watch) and simply learn to just to enjoy it for what it is. We open with a nice model shot of the Liberator in orbit around a dough ball. Actually its made me realise that there is another subtle shift in the style of effects work for this series. There’s more depth to the shots, as it looks like they have abandoned the front axial projection methods they used for series 2, which, as good as it was, often looked like there was a faint outline around the Liberator. The planetary surfaces featured in this series feature distinct lumps and bumps around the outline. Man alive, these planets must have mountain ranges on an astronomical scale! Servalan’s set is not as good, (see Volcano) but it is lit a bit more sensitively, leaving it looking a bit more green than it’s last appearance. It made me realise what impact different directors/lighting directors can have on the same set. But it’s still got that godawful grating sound effect in the background. There’s trouble brewing, and not just for the Liberator crew. Dastor communicates the first subtle hints of insubordination, and threat to Servalan’s esteem. It’s the beginning of a subtle story thread that will run through the third series. She was untouchable in ‘Volcano’, but here there is a challenge, then in ‘Children of Auron’ there is in-fighting in her ranks which actually ruin her plan, then in ‘Moloch’ there is a full scale mutiny, leaving the events leading up to her appearance in ‘Terminal’ ambiguous. It’s a nice little progression. I’ve got to say in this early scene, I couldn’t help but notice how much fun Jacqueline Pearce is having here. Every line is delivered with aplomb and feminine charm. Compare these scenes to her preceding episode ‘Volcano’ where she seemed a bit humorless, a bit lacking in the charisma that is an integral part of her make up. Oh, and I love the way she says ‘Dastor’ – such relish! And ‘an artisan‘. And ‘my what‘ – that the longest ‘whh‘ I’ve heard so far in a series chock full of received pronunciation. Then we are introduced to the main plot device – Sopron. But why is Avon so obsessed with it, and how does he think it could benefit him? Perhaps this could have been something that the third season could have explored more. This is one area of the newly formatted series that is variable. There is no real reason why Avon should care about it, or at least nothing that is adequately communicated here. Perhaps if there was more of a theme that drives some of the adventures here it might be more plausible. For example could the discoveries made during the series could sit within the context of piracy – the crew resorting to something that is beneficial to the Liberator and it’s crew in this safer, less threatening, post Star One universe. And then enters Jarvik the Artisan. Full of testosterone. And a good catalogue of postures. Hand on hips at the start, with a smirk. Later his top is undone to the waist. I can imagine the shooting script – shoot him using a low angled camera, and make sure the actor looks upwards a little bit. He snogs Servalan, and talks to her with as a little words as possible. It’s all a bit 1950’s Tarzan type. He clonks a couple of Federation guards in a scene that has a very strange choreography when Jarvik is pointing a gun at her. Servalan demands to be obeyed, yet how can the guards protect her when she has her arms outstretched in front of them? ‘He thinks and acts like a man, not a machine’ – there is more to this line than just gender themes. It also translates that this episode is, to a greater extent, about how mankind is more imaginative than the technology he has produced. I say ‘he’ – because this is a Ben Steed script. See my review of ‘Moloch’ for more about this rather notable writer of Blake’s 7. So Jarvik is a man. And because he is a man, he is the driver of the episode – at all costs. I actually think that Steed writes three quite entertaining episodes during Blake’s 7 – not always for the right reasons, but equally not all for the wrong reasons. His scripts move along at a good pace, he writes good background plot, and establishes good relationship between characters, but the gender themes are so big, so bold, so…full of testosterone, that everything else struggles to reach the surface. I still don’t think any of his three episodes win the title of the ‘most dated’ award – there are other episodes that win that for me. Steed’s study of gender (if we can call it a study) is inextricably linked to what mankind has created. Take Jarvik’s assessment of progress – ‘Madam, in ancient times they read the future from the torn out guts of small animals. Two millennia later it was in the remnant leaves of a herb in a drinking cup. Ask me, and I’d say that civilization has learnt a lot to little positive advantage’ – this is pure Steed, and what I think is his signature. But then later on, Vila says ‘I suppose I could retire to the lakeside of Gardinos and be waited on by those cute, little…‘ – it’s all about gender again. At this point I just wanted to pay tribute to Frank Gatliff’s portrayal of Dastor. Gatliff will always be the type of actor who plays authoritarian figures, such as in Doctor Who – ‘The Monster of Peladon’ (1974) or most notably for me, being on the receiving end of Margo Ledbetter’s acidic tongue in ‘The Good Life.’ But here he plays it nicely – switching subtly between humble to ever so slightly put out when talking to transporter Captains. But the key feature at this point of the episode is Jarvik’s big moment, during a scene set in the staff kitchen at Servalan’s HQ – all flat pack furniture and cabin lighting. At this point I got distracted. I started to wonder what it was in our crew that feels and how they would express this to Servalan. So Servalan – a character always depicted as totally in control of her own sexuality – is literally whisked of her feet. These scenes are great fun, as two strong minded people metaphorically jostle with each other over ghastly looking post-coital blue milkshakes. Meanwhile on a planet far, far away – Kairos to be exact – things are afoot. Workers are roaming the fields. The Ben Steed fencing, makes an appearance for the first time (see Moloch) and there is a nice cut from film, as Captain Brotius Shad (Anthony Gardener – from ‘The Macra Terror) walks up the steps and straight into the world of video, and following a consultation with Servalan blasts off without the guard, played by Andrew Jamieson – now an established painter. I love the scene between him and the worker. It’s fun to pick out Stuart Fell, and see the moment he makes a bid to climb the fence. There’s other familiar faces, such as John Cannon – who around that time would actually get a few words as a Atrian guard in ‘The Armageddon Factor’ around this time. They’re BBC family really. Tarrant – despite being a know all – is reasonably likeable, and his frustration with Avon feels perfectly valid for once. But the scene in Cally’s quarters is a wonderful demonstration of how Avon will always get the last word. And on Space Command HQ, Jarvik says ‘Ease your way in’. Disgraceful! Abhorrent! Vile! These lines shouldn’t belong in a ‘Carry On’ film not in Blake’s 7. I demand a full refund on my TV license! Steed writes great one liners throughout this three episodes. Take Zen’s retort to Servalan about how the Liberator is operated. ‘One manipulates the controls, and the craft functions accordingly.’ We’ve not seen this level of characterisation since the pre Orac days. So the tables have turned. Servalan has the Liberator, and Jarvik is revealing more of his ruthlessness. He says that Mutoids piloted the ships that were destroyed by the Liberator. ‘I wasn’t prepared to see men die‘ – yet he was happy for a ton of them to be gunned down in the loading bay. Unless of course they were Mutoids disguised as men. Cover your tracks, as they say. It occurred to me that Jarvik knew of Brotius Shad from another time, and spoke of him highly. It’s funny but the first moment that Captain Shad uttered a line of dialogue, I knew he wasn’t going to be the brightest button in the box – following a long line of dimwitted Federation guards. Wrong. Captain Shad turned out to be one of those rare beasts in ‘Blake’s 7’ – a character who simply followed orders to the letter, and did what he needed to do quietly and clearly. Oh yes, one of the best. It’s not his fault lumbering Jarvik got in the way of his fatal blast! Series 3 is about the chemistry between characters. Something of which I will talk about in ‘City at the Edge of the World’. Take the fabulous scene between Avon and Servalan. Real series 3 type fizz. It is said that this episode was written with Blake in mind, instead of Tarrant. Yet by the time the action moves to Kairos itself, it is Jarvik who is dressed like Blake, and Tarrant is dressed in his favourite boy pajamas. 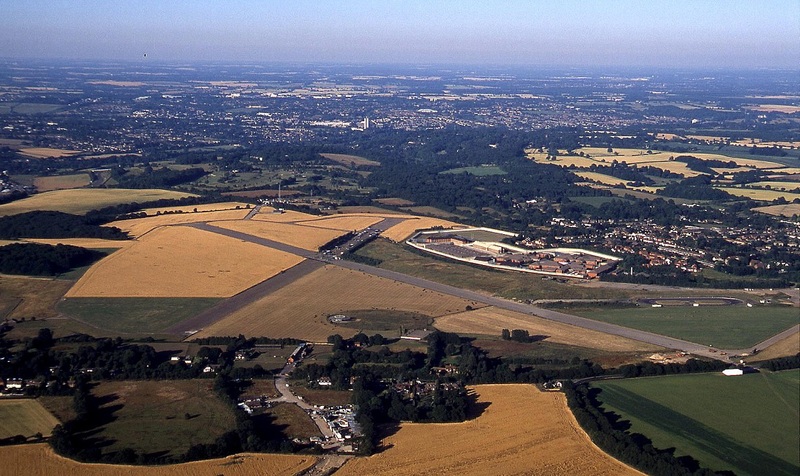 So far in series 3 we’ve seen the range of quarries largely substituted with beaches, woodlands, gorges, rocky moorland, and now big swathes of grassland found at Bovingdon airfield in Buckinghamshire. This is a location that has hosted many a film and television series, from Patrick McGnee and Diana Rigg jovially running around with Roy Kinnear in ‘The Avengers’ to Christopher Lee getting one over Roger Moore courtesy of a flying car in ‘The Man with the Golden Gun.’ In ‘Kairos’ however, we’re talking about vertical, not gradual ascent so the action takes place away from the runway, and towards the fringes. OK, lets talk about the spider. Actually I think this is a case where the ambition is the guilty party here. Blake’s 7 and Doctor Who, repeatedly fell into the same trap – the big monster. The Shrivenzale, the Magma beast, the Giant Rat – again and again. The body and size is pretty good – and it’s a better attempt than the surveillance robot featured in ‘Seek-Locate-Destroy’ and ‘Project Avalon’. It’s not simply a case of it’s not good enough. I think it’s not helped by the glorious sunny day, and Gerald Blake’s decision to shoot it in long shot, and a side on shot as it lumbers across the unforgiving terrain. What is effective however is the special sound – specifically the gradual build up on insect noises on Kairos. With each successive scene, the is a greater intensity, and range of sounds, which creates a good sense of approaching menace. For an episode that has built up the mano a mano conflict, the actual fight scene is not going to win any awards. Tarrant grimaces has he attempts to hold the knife correctly, and the two of them grapple in long shot in way that blurs the boundaries between survival of the fittest, and tender yet passionate clinch. So lets talk about Cally. There is a real sense that she barely relates to the character we we were introduced to in ‘Time Squad’ – she has lost her physicality and her sense of urgency. Compare her alertness and movement in episodes such as ‘Bounty’ to here. During the scene where Jarvik and Dayna are grappling, Cally is just standing around as though she has lost her instinct as a fighter. In my head, this is the on-screen moment where Jan Chappell decides to call it a day. The actor is quoted as saying that she just lost heart in the series during the location filming here, but luckily for her at least there is the consolation of a couple of good episodes for her character before the series is out. Back on the Liberator, the episode reaches it’s conclusion, and while the idea of reflecting something back on itself is – on paper – a nice way of rounding off the episode, it requires an intelligent, strategic character such as Servalan to buy it. And I’m not convinced she would buy it in any other circumstance (I.E an episode written by another writer.) And then Jarvik goes and gets himself killed in another clumsily choreographed encounter, echoing the first encounter with Servalan on her star cruiser. It’s a disappointing, and rather throw away demise for a character who had good presence throughout the episode. Andrew Burt plays this role as required, and has some real screen presence. He was clearly able to hold his own in a range of dramas, such as ‘The Voyage of Charles Darwin’ – a 1978 BBC drama awash with Blake’s 7 alumni, such as Malcolm ‘Leitz’ Stoddard, Robert ‘Ven Glynd’ James, and…that bloke who got turned into a husk by the virus in ‘Project Avalon. Gerald Blake – director of this episode brings some nice touches, and a reasonable sense of fun to the proceedings – albeit sometimes clumsily. Around this time, Blake was working on a number of episodes of ‘The Onedin Line’ and had recently helmed his second Doctor Who adventure – ‘The Invasion of Time’ (1978) where he had to contend with strikes, out of order shooting schedules, last minute re-writes – yet he was still able to pull in something quite watchable, and also with a degree of tongue in cheek humour. In fact Graham Williams (producer) was quoted as saying it was his humour and ability to keep people happy in the most trying of circumstances that led to him being commissioned to direct this final story of season 15. The same humour can be found here – his first contribution to the show. Check out a moment from ‘Blake’s Bloopers’ – the outtake reel compiled by film editor Sheila S. Tomlinson – which clearly shows a director with a sense of jovility as he tries to work out where a regular character has teleported to. In this instance it’s none other than Gareth Thomas – a regular no more – although still happily connected to the show. Whilst there are some nice touches here, it’s his depiction of the psychological elements of ‘Death Watch’ later in this series that shows the most discipline as a director, and is his best work. Another cast and crew shot with Gerald Blake in centre right. Not a huge amount that is new in this episode, so perhaps from a design point of view, this is a cheaper entry. The lunar module is her perhaps the most ‘meta’ set in Blake’s 7. It’s designed to be a rust bucket, but and it certainly succeeds through a mish-mash of control panels cobbled together from the BBC scenery department, and the flimsy sounds it makes as Avon tinkers with the controls shows that sometimes it not about how a set looks, but more how it sounds. Elsewhere, there are some utilitarian design for the loading bay on the transporter. And it’s interesting to see that the Kairopan transporter will make another appearance in a couple of episodes time. Nothing out of the ordinary here. Some big brass dominates, particularly in the first half of the episode as action unfolds. There’s some more tender moments which bring in the woodwind, but the score that accompanies the fight scene between Tarrant and Jarvik is disappointing – substituting adrenaline fueled action with some jazzy licks, ride cymbal, clarinet and trumpet. It’s a right old hoot this one, and the representations of gender can be watched very much as a part of the (televisual) times. Look, lets put any grievances away and join in the fact that Jarvik is very funny to watch. Not the spider, but the fight scene between the men. Great fun, but not every episode should be like this.